I’d like to just forget about all crawl spaces . . . but, I can’t. You see that is where some of my best work occurs. 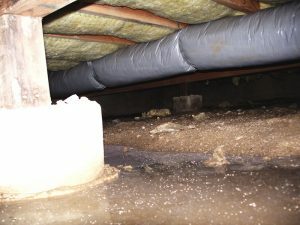 It’s also where some of the worst problems in your home can come from: moisture (in various forms), pests (big and small, and very small, ones), leaking water and sewer pipes, electrical wires hanging in the mud, cracked foundations, damaged and rotted posts, just plain “ickies.” So, why write about this forbidden space? Because there are plenty of things “down there” that need attention. 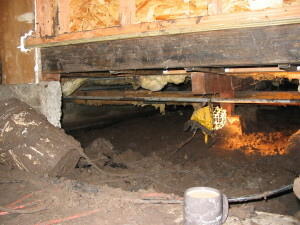 In many places around the country, a crawl space is used for ventilation. 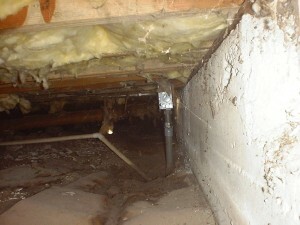 The theory is that air should move under your home and keep the floor’s insulation dry. (This idea could lead to quite a discussion, and is currently being studied by the National Energy Commission – see: Advanced Energy Org – Crawl Spaces Studies for much more on this; many links out from there also) Another thing to remember is that your home environment is usually more closely tied to this space than you may think, particularly if you haven’t checked it out lately. 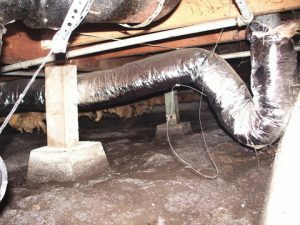 Your heating system’s ducts may run through it, picking up air and vapor that is contaminated. There could be “life” down there, that you don’t want to become familiar with. I had clients some time ago now that didn’t want to think about what was in the space below them. 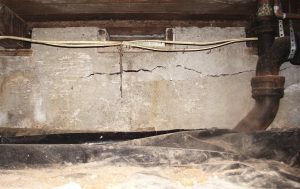 When tearing out a rotted floor (the rot had affected the shower, the adjacent rooms’ walls and floors, etcetera) we realized it was definitely time to see what was happening below. The owner wanted an inexpensive fix but there was none. 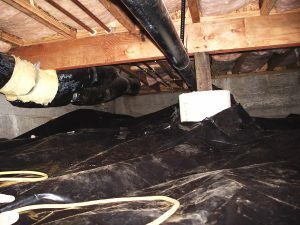 The attempt would be to install a working sump pump (for moisture that entered every winter and probably stayed most of the year), and then to repair the damaged floor and shower. When we got into the framing it was pretty clear that an ounce of prevention would be worth much more than the pound of cure. 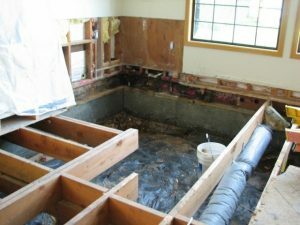 There was six to ten inches of accumulated water in the space at the time – so much that we couldn’t do much of the work that was needed without removing the water first. The fix was not a financial option for these folks. We patched things together as best we could, but I still wonder what ever happened to the problem that we had discovered. Another project that I looked at more recently showed moisture damage in another way. The sub-floor was intact (for a while yet) but the steel posts supporting it were mostly rusted and broken away. The owners were wondering why the floor under their nicely remodeled home was undulating. Well . . . . I don’t know what ever happened at this home either as they decided to go with someone much less expensive. Hopefully, they at least did the required work.